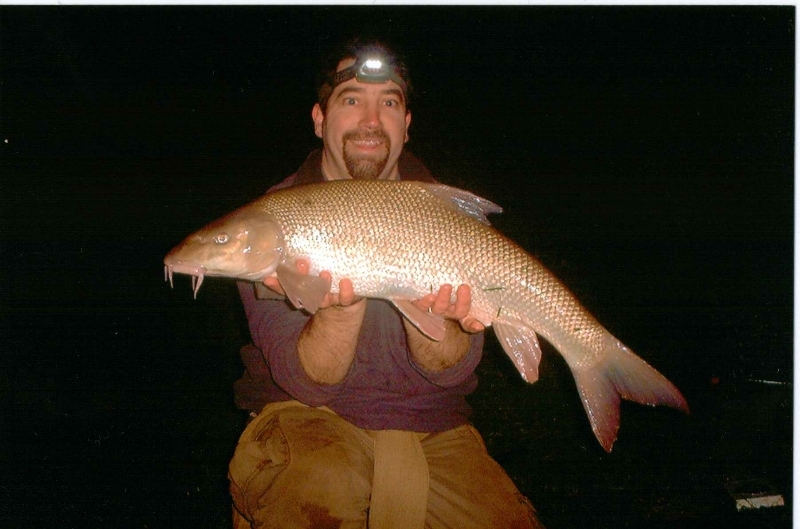 Last week saw some of the best conditions of the winter for Barbel, with lows blowing in off the Atlantic, and even a named storm! 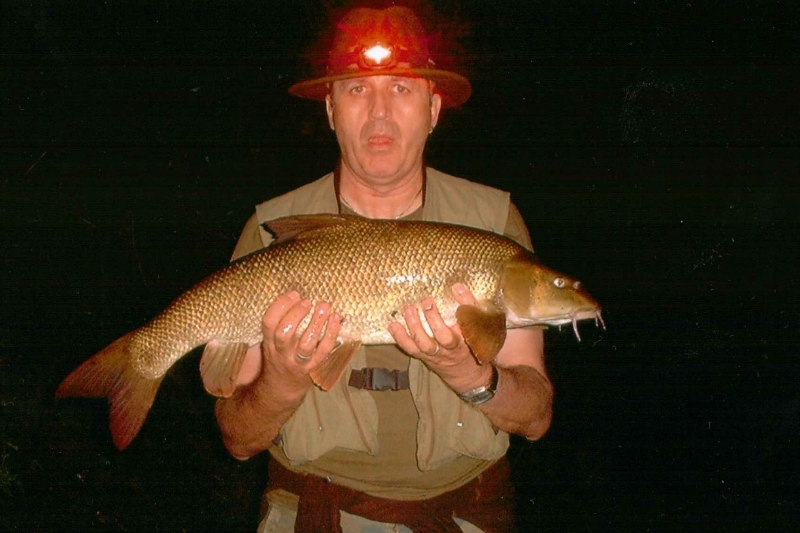 Time then, to get out there wherever safe and possible…..and many anglers did, reporting catches from what seemed to be every Barbel river in the country! They were feeding!! I had a lot on though last week, and only managed to grab a few hours after work of these prime conditions, but very glad I did, as the fish were biting and five graced my net with four of them coming to my new rod too!! I shall have to name it “Doris”…. 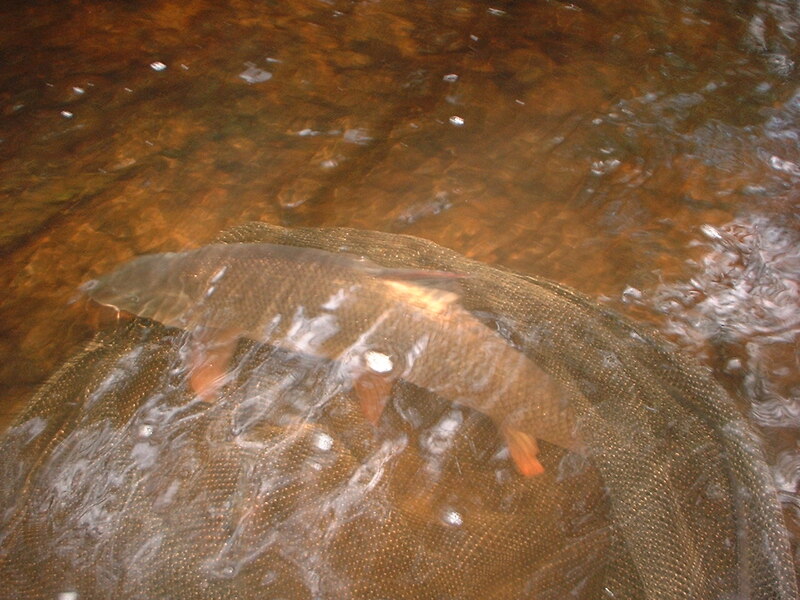 Good luck to everyone for the last couple of weeks…..
My Most Northerly Barbel & A New River…. Circumstances had conspired to allow me a chance of trying a new river this February, the river Wharfe. A beautiful riffle and pool river with a few Barbel in it too, (so I had been reliably informed). The temps were rising slightly though still very cold, and rain was pouring, allowing the rivers to flow and rise on the very day I was dropping a line! I walked with great optimism across fields to find that no other anglers shared my enthusiasm for being cold and slightly mad…..”He who dares Rodders, he who dares”. I had found the Yorkshire air to be quite dramatically colder than South of the midlands. This was after the previous evening`s reccy which saw me get soaked through all layers, and this morning had to pop into a charity shop for a new/old/”dry” jumper. Fancy travelling all this way and not packing my usual quota of spare everything!! The fishing approach would be a searching one, roving and trying different area`s, not waiting too long in any particular one. 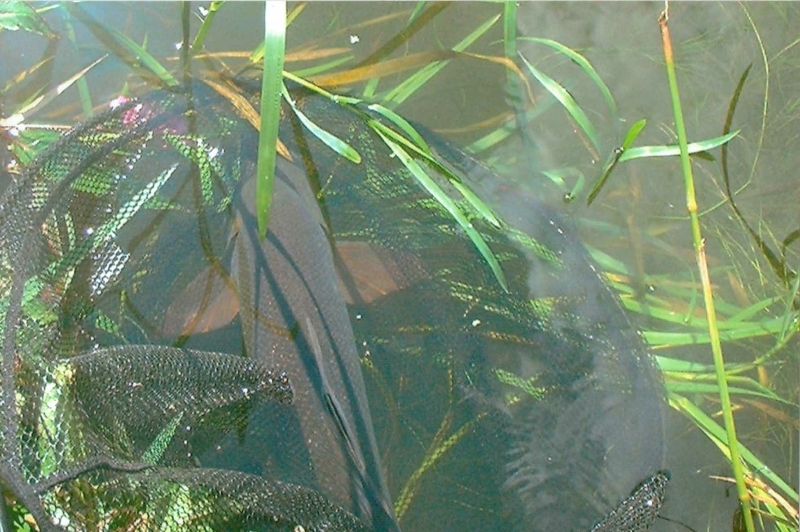 A good smelly bait, will usually get you a bite quite quickly in these conditions, if you are near some fish! In my third swim, I found I “was” near some fish. A couple of bumps indicated life, and just as I was on the phone to my mate…the rod pulled round into a fishy curve. As I explained I was in but not sure whether Barbel or Chub, the fish lunged and took line as only the Barbel will do! I love this type of fishing, holding the rod and feeling for any movement, second only to seeing the fish you are trying to catch, and watching them take the bait. 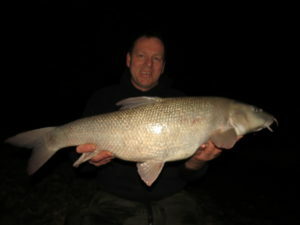 This one had, and after a spirited fight in cold water, a very lively and cold 6lb 3oz Barbel was in the net. 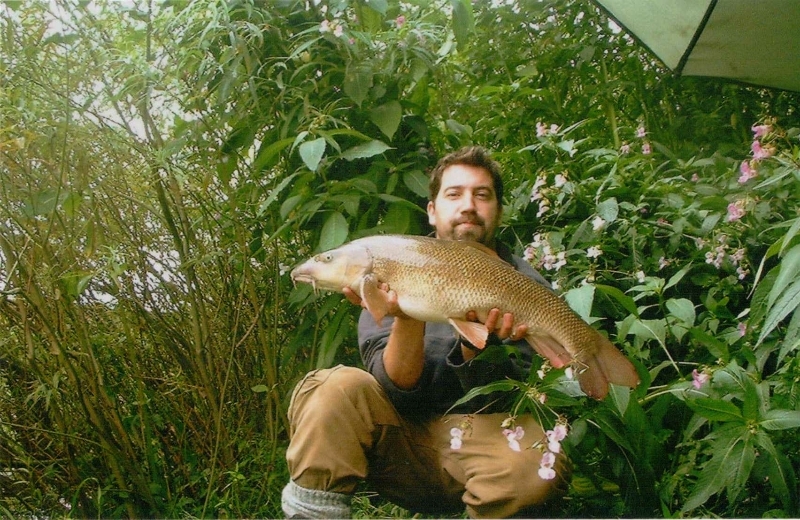 It was approaching the warmest part of the day, and during Winter this is often the time you will find a Barbel willing to feed. I was over the moon, and after adding a Chub to the day, I was off to visit an elderly relative, and have a good catch up. A “Very Happy” Start to the New Year! We have been in for some funny weather really, with rises in temp (and drops) without real changes in conditions, ie; rainfall, drops in pressure & Westerly`s! But this said, I have managed a couple of outings for 2017, and caught several new fish for the new year! 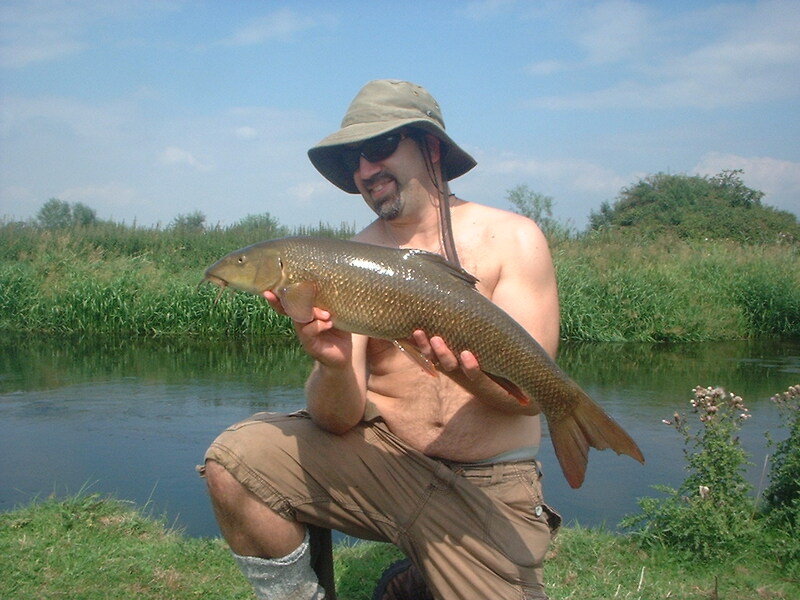 One outing which was a real joy to behold, saw my friend and I meeting up on “his” river, (The Thames) and me witnessing the biggest Barbel I have held, and for him…..a P.B. This was the big framed beast…. (Fish not Gary). We Knew we were in with a good chance of bites after a slight increase in temps, and so it was, that after the first hour into dark, we had 6 bites between us!! Unfortunately my 3 were Bream! Gary`s on the other hand were our target fish as well as a bonus Bream!! He had started with a first cast rod wrencher of 8lb and then a bream, followed by another rod wrenching Barbel nearly twice the size of the first fish!! We were both really chuffed with this chunk, not a really long fish…but very big framed, and deep. When I had left Gary, he had said he would be down shortly to photograph my Thames P.B as this should not be difficult, because it currently stands at 5lb8oz! I had said (half in jest) that I might be down to picture his Thames P.B (it would need to be big, and it was)…….It`s a funny old game! Congratulations mate on a fantastic fish…glad to bring a bit of luck!! A Last Chance before Christmas..
Well I have my persistent daughter to thank for our last trip as she really wanted to go and it was her turn. We opted for the Severn this time as it may hold the temps better as the air was cooling this weekend. We arrived quite late to try for a few hours before tea, supper and bedding down. It was cold but had some promise, only for two hours and three swims to pass without a bite. Isobel was tiring, so time to head back to the car was upon us. The next morning we awoke to find 6 cars (well it was Sunday, I suppose), so reluctantly, we moved location to a stretch further down river. We had a late morning brunch, and then set off to see if we could get a bite before the Christmas festivities.. Knowing of an area likely to get us a bite for lunch, we took a walk and while waiting for a bite had a right laugh, Isobel was being quite negative about any chance of Barbel, and just as I was beginning to agree with her and getting ready to reel the rod in, my wife called! This can often be a good thing, so I would leave the rod for a few minutes more while we spoke….after a few minutes I had to put the phone down and help Isobel, as the rod pulled round! It was a nice 9lber, and we were chuffed, Isobel jumping around and saying “yes, yes”, she was really pleased because she wanted to show her school friends after Christmas, the photo`s of what she had been telling them stories of! Next cast….we had another! This was turning into an unexpected success! With the wind cold, and afternoon upon us, we set off for tea at the car before heading home. Isobel was more than happy with this and I was pleased to get some action before the break, (perhaps extended by cold conditions), but I had a nagging feeling that an area not far from the car might produce a bite or two on dark. I convinced her we should stay a little longer over our cuppa, so we did, and it did not take long for bites to come! 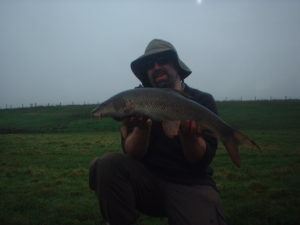 First cast a chub, second a bream, third a chub, then another bream and it was getting dark again and very foggy! Next cast was promised to be the famous “last cast” before home, two rods were out and the upstream went over this time more deliberate and Barbel-like, and it was! 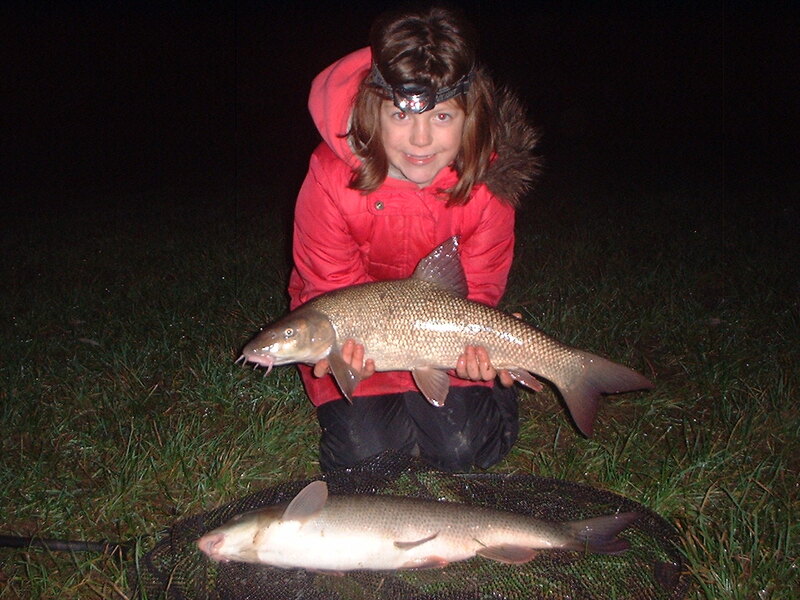 Just as we were laughing and getting ready to put this one back….off went the downstream rod with a very similar sized fish, and here’s Isobel with the two for Christmas…. A happy drive home in the fog was had, ready for Christmas to come! A Surprise Catch 22 Situation!! (Thanks go to John Newman for this title). Something very special happened last week…. 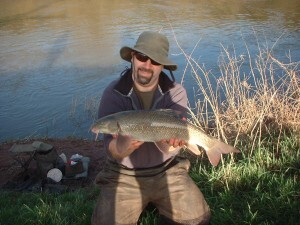 Conditions were good for Barbel, but the rivers were rising too fast, and were soon impossible to fish. We (all anglers) would have to wait until they fell within their banks for a try! 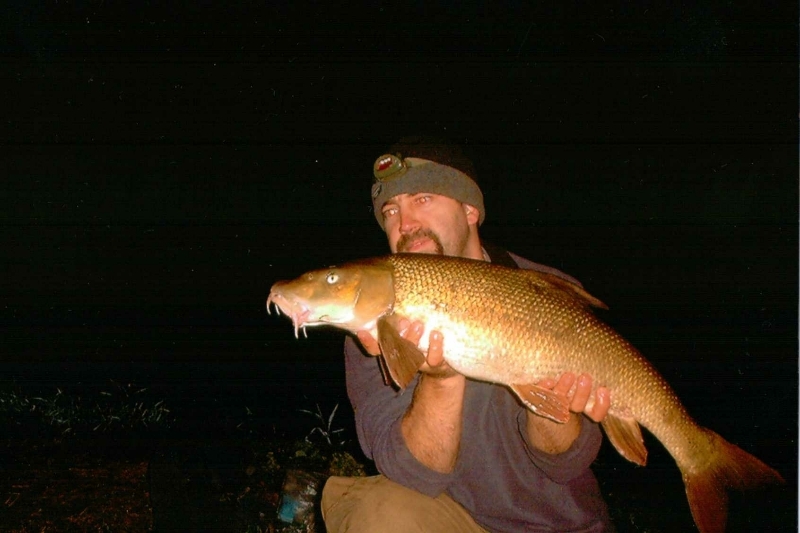 The air temps were dropping with the river levels, it became a race….Where to fish? & when? And how to get out from home and family, being fair to all?? With my wonderful wife`s approval granted, I could see the Wye dropping fastest first, so there it would begin, but upon arrival the water temperatures were low 6.5C (at best) and dropping, so roaming a mile of bank high river, it came as no surprise to find no-one else out. But having dropped into my 4th swim, my efforts were rewarded and a fighting fit and freezing cold 9lber was banked! Pleased with the result so far I went to regroup at the car and cook some warming food, the seeds of plan B had re-emerged and so this would mean heading over to another river which had now dropped within its banks, and was sure to be warmer, as it was not fed by the Welsh hills! The adventure was just beginning….. The first cast was just a light swing and drop of the line into the desired spot, a couple of rod lengths out. Now a little time would soon tell if there were any fish in the area, so I would hold the rod and wait. The wait was not a long one, tap tap, and then a developing pull as the small mouth of this 6lb Barbel was engulfing the meat presented for his pleasure! As soon as I “met him half way” we were in to a good tussle, which saw him take some line and run for cover, before much more of the same in front of me! Having unhooked, and measured this cold, and delightfully frisky fish, I would rebait and cast while he took a moment to recover. Hardly had his tail said goodbye with a whack and splash away, the rod was off again! This was indeed how it was to be….the next cast/drop in, would not let me put the rod on the rest before pulling round again. The 4th fish was a good one (as they all are), and a double to boot, only just at 10lb2oz, but who`s counting? I could imagine the fish packed under the surface as they sometimes do – like a bundle of sausages – with them gently taking it in turn to leave the group and feed on the offerings beginning to mount up in the area in front of them…..or perhaps they were out together knocking each other and competing to get the food before the next fish did. Either way, the bites kept coming and after 12 unbelievable casts, I took a break. Not expecting to come back after tea and find them still in the mood! I have been lucky enough to have sessions like this before where the location combines with the conditions to make for some amazing sport, but this was probably the most surprising as this river has suffered a fair bit from predation, and has never been known for producing more than a few at a time. Although some of those few can often be big, and fished for regularly, the area is also fairly new to me, these factors making the catch what it really was. So after tea and back in the swim, I tried to speak to my wife, but was interrupted every time with another bite, well, three times running! Then I finished the call with the hook on the bank. 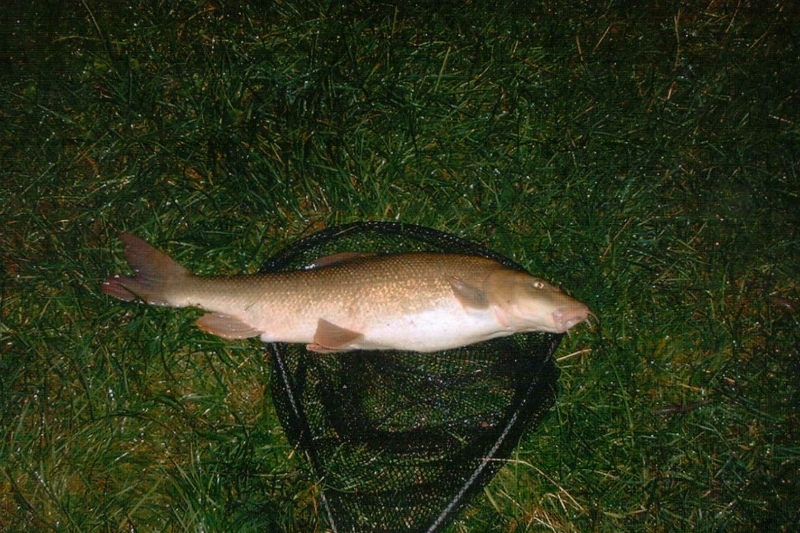 The twentieth fish came and was another double, (this one four centimetres shorter than the last & 2oz heavier, probably from the feed she`d gained while waiting to be caught)! But I was beginning to think that repeat captures may come, surely after so many fish they might…this happened once on the Wye when my 26th of a 26 fish catch was a distinct repeat fish from much earlier in the day, (in a swim 150yrds away)…it was time to pack up then, and would be now if repeats were coming. Not to mention of course, I had done my best to empty the river already, and had an aching arm! It is however, the 2nd hardest thing to do, to drag yourself away when every “one last cast” gets a bite…(The 1st being when you have had no bite at all)! So a couple more casts just to confirm that they were still there and sure enough they were. I would have to tear myself away, with a promise to come back again….as soon as my arm had recovered and conditions looked good for it! Cold snap on us now, so enjoy what you fish for and look forward to the next front with warming westerly winds..
A Handsome Hampshire Avon fish!! Summer is upon us & the season well underway.. Already I have been lucky enough to have had, and have been involved in, some memorable captures. The rivers have started well with fish coming out for many of those trying, and some big ones too, eh Matt Marlow? I have also been taking part & helping where possible, with studies which are being sponsored and supported by the Barbel Society. I am now an RO (Regional Organiser) for the Bristol Avon catchment & general area. I am currently looking to set up regional meetings which will help raise funds towards research and conservation projects, so watch this space…. 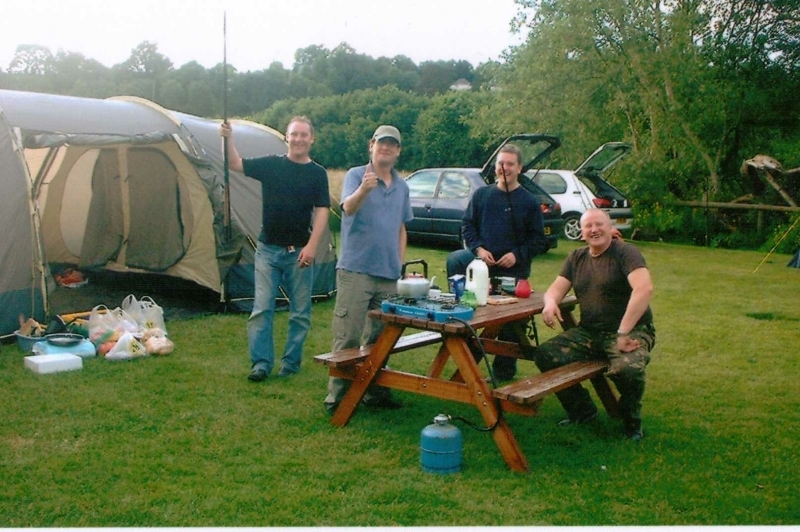 My friends and I started our season as every year, with camping and fishing around the river Wye, and as every year, it was a joy to be there! We caught plenty of fish, although it was a little slower than previous years, each one was appreciated (even the hoards of Chub). The social craic was as good as always! With the rains we have had, the rivers have been up for the first weeks, and it has been difficult to decide where and when to fish. 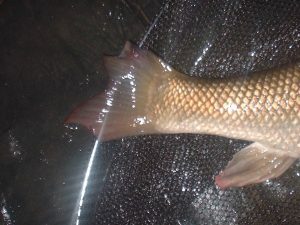 The chance for the Avon popped up last week and I took it, the river had good flow and even a little colour which meant perhaps more bites……but a first cast fish of just under 8lb? So it was, a very “special fish” considering I had not visited the area for more than a year, and in those previous visits I was seeing Otters every time, which can be very off-putting. I had laid low and was fishing less than a rod length out over a little pre-bait of hemp, the fish had come in to inspect as I lowered a disguised rig nearby. Nothing until after 20minutes or so a pick up and bolt!! The fight was a royal one, the fish a beautiful one.. This fish had battle scars, part of it`s tail and dorsal had healing damage on them, more about this on a later fish! Just after this, the wind whipped up and brought a – dark as night – storm. This blew out after bouncing rain lasting half hour or so, only for the sun to shine again. This repeated (only not so severely) for the rest of the session. Things were looking good, and after speaking to other anglers, and avoiding constant showers, it seemed there may be more chances! 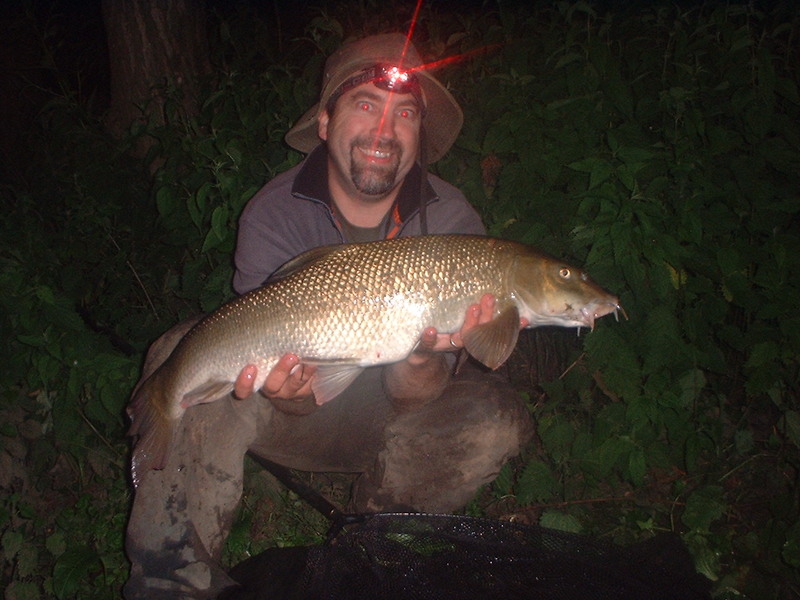 So I moved to another swim, and the formula worked again…Chub and Barbel up to darkness. Then things went quiet until a couple of bangs suggested fish were near, this didn’t take long to develop into an “I`m gonna ave your rod” bite…and fight. 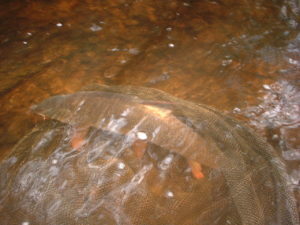 My rod, perhaps a little soft and under-gunned, doubled over in the flow, but managed to handle the battle admirably. The fish pulled so hard, I wonder what the fight would have been like if it had had all of it`s tail….. It was 10lb 2oz and I was off for a sleep very happy with the afternoon. A move then in the morning for a cast or two before heading home. 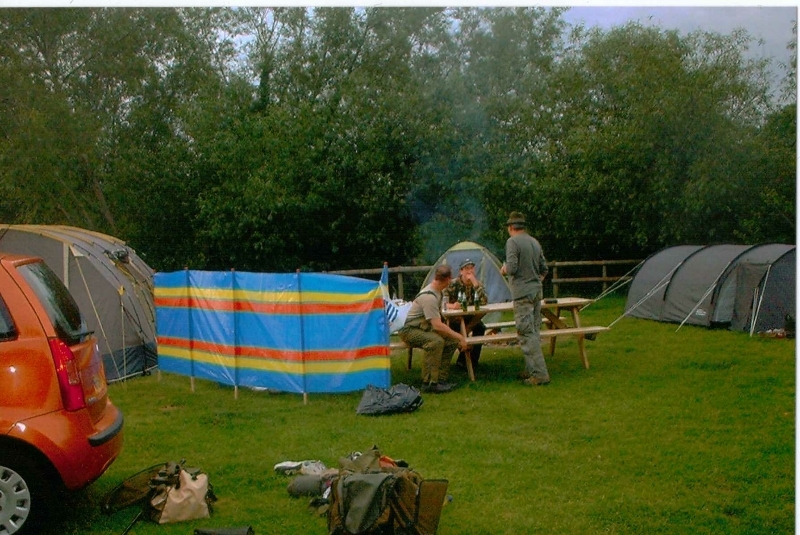 Having walked and set up in burning sunshine and heavy rain the trap was set….I then received a call which meant I`d have to pack up and leave right away! I was just turning to do this when the rod decided to do it`s own thing, and head off for the river. Of course I grabbed it just in time, and the drag began to scream, this was an angry fish and felt heavy too! The initial run had taken more line than I would have liked to allow! The fish had gone down the inside along the lily pads, and was beginning to get the better angle on me, so keeping the line tight, I stripped down to my pants. Waterproof trousers boots socks & all, had to come off quite quickly, and did! I was in the water and walking through the lilies, keeping the line tight very aware that this is when hook pulls happen….I was lucky for my efforts! The fish came up over & through, and was in the net. I was surprised to hear a voice from behind and turn to see another angler just arriving to fish here. 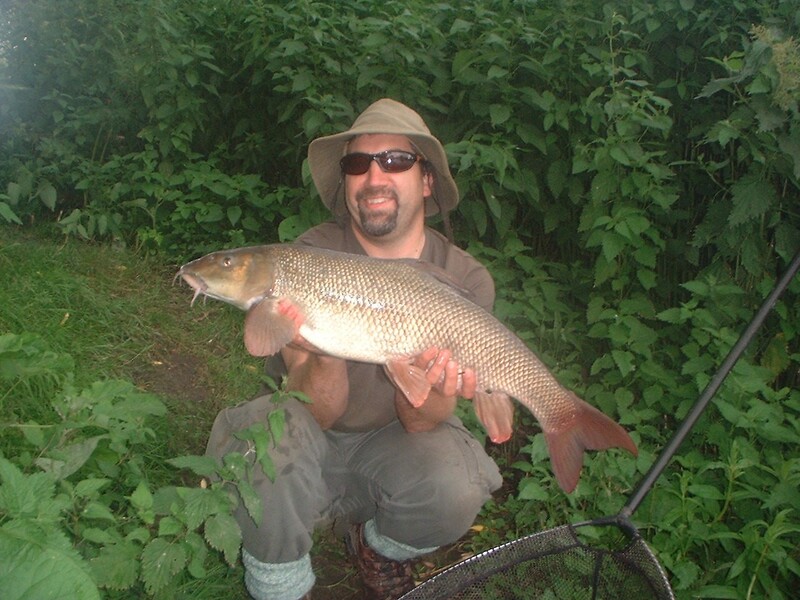 After explaining my wading habits etc I got myself sorted, and then realised the fish was bigger than I had thought, better take a picture…..
Hi all, and a very big welcome from me to the new season….Good Luck and tight lines to everyone out there enjoying our rivers!! I shall try – as every year – to keep you posted here with updates of how the season is going, and any news or info regarding our rivers and some of the conservation work being done to keep them from harm! All the best, & keep getting in touch too…. My last couple of colder weather sessions have been on the Wye this year, and I have to say how nice it is to get into some smaller fish and appreciate all of our Barbel, and the scenic places they inhabit! That`s still not to say I wouldn`t mind a Wye double, but I have been very lucky with them and had quite a few in the past seasons. 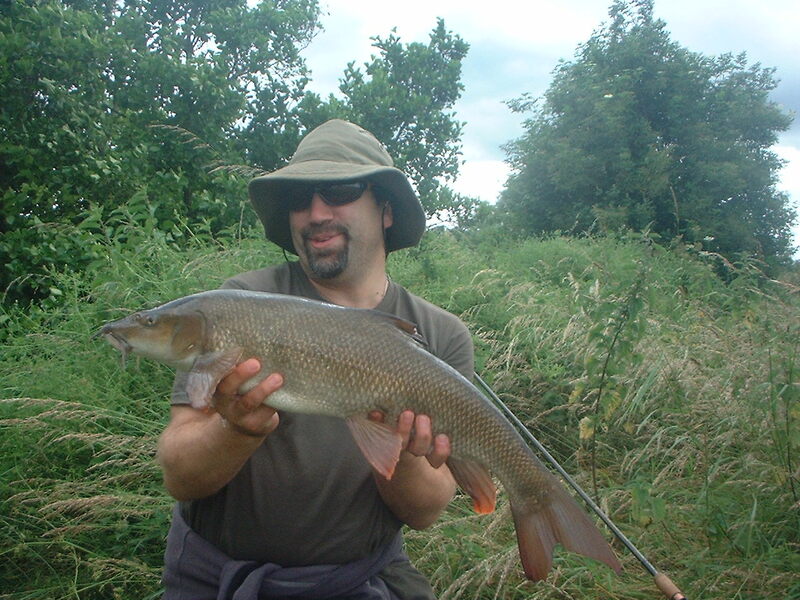 So bites will do for starters…..
A sunny afternoon Barbel…the smaller of two, this one was 5.5lb! 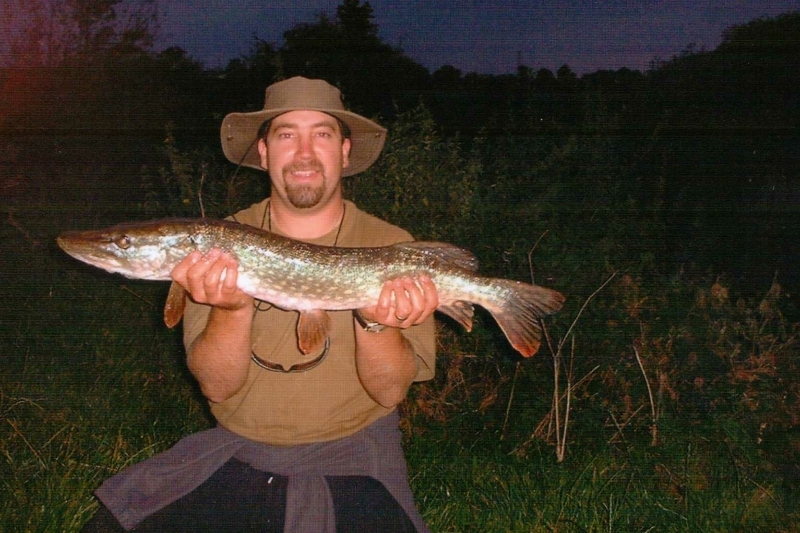 The approach and tactics are similar on most rivers in these conditions, particle baits are favoured with maggots being the first on the list, then something smelly, meat perhaps, and a moderate amount per swim! 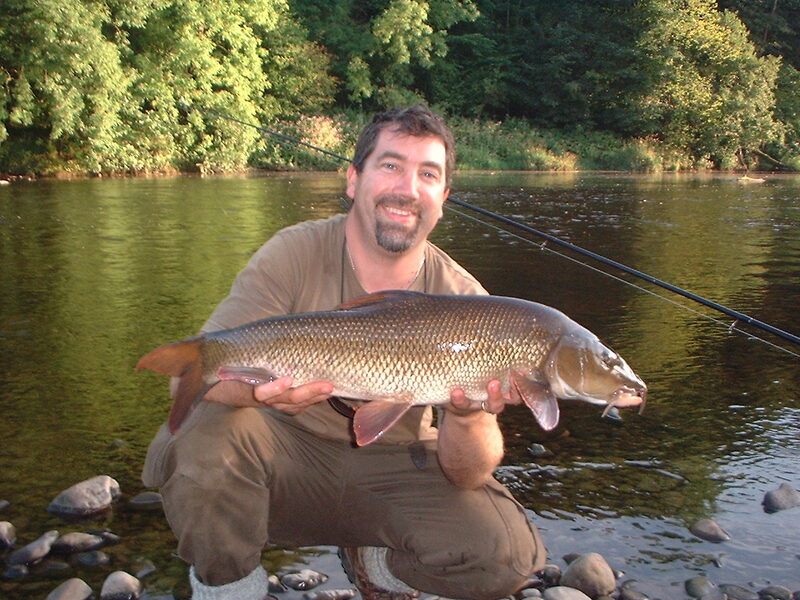 Getting the maggots “in” can often draw all fish and therefore tempt the Barbel into moving to feed. This done, you can usually get a few bites soon after! The weather has turned the wildlife upside down, they don`t know anymore if spring has sprung or whether they missed it at Christmas! This said, there was much birdlife on the banks last week with over 10 breeds counted, including a Buzzard and Barn Owl working the field of corn stubble on the opposite bank for movement of they`re next meaty meal, (and a Cormorant, no longer a sea dwelling stranger to our rivers). 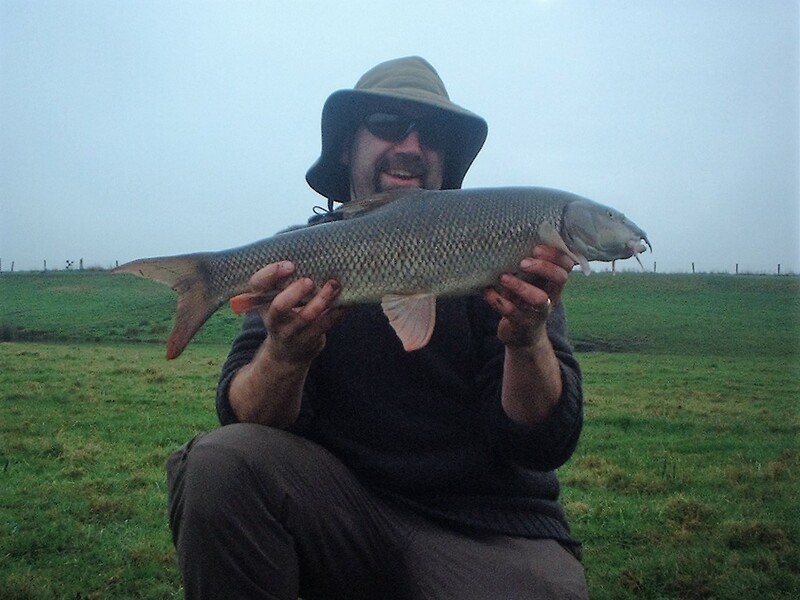 Not so many birds yesterday though, with a biting North Easterly wind sending all for cover, and making the banks quite devoid of much life at all….though a couple of Barbel still awoke from their new found wintery slumber, and duly put my rod and line under strain! A happy and content angler is left with the impending close season drawing ever closer…..
Good luck all, I hope you have a fantastic end to your river season.